Home PnP PowerShell PowerShell Search SharePoint Online Site Collection Subsite SharePoint Online: How to Trigger Full Reindex using PowerShell? 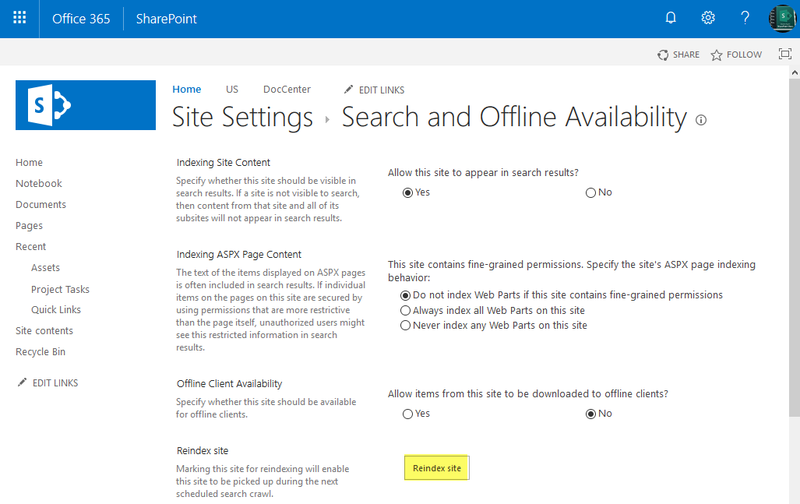 How to Reindex the SharePoint site? After mapping a crawled property to new managed property in SharePoint Online, We had to Reindex the SharePoint Online site. Typically, whenever you do changes to the search schema, You should Reindex the site. Unlike SharePoint On-premises, where we use Search Service application to trigger a full crawl, We can't force a full crawl through the admin user interface in SharePoint Online. Instead, we've to go to each site and manually trigger the crawl to accomplish the same task. On Search and offline Availability page, Under Reindex section, click on the "Reindex" button and confirm the prompt. Please note, We don't have any control over the crawl schedules! SharePoint Online targets between 15 minutes and an hour for the time between upload and availability in search results. In cases of heavy environment use, this time can increase up to six hours! Behind the scenes, when you click on Reindex from SharePoint Online site, there is a property called "vti_searchversion" gets incremented to instruct SharePoint to denote the site needs to be reindexed. So, lets use PowerShell to reindex site in SharePoint Online. This marks the site for reindex in SharePoint Online. Lets change the script a bit to iterate through all sites within a site collection to trigger re-indexing for all sites in a site collection on the next crawl cycle. This PowerShell marks the SharePoint Online site for reindex in next crawl.